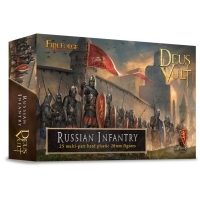 This box enables you to build up to 25 Russian Medieval Infantry soldiers in h.. This pack contains: - 1 Officer - 1 Horn Blower - 1 Standard Bearer - 1 Tr.. This pack contains: - 4 figures armed with bows - 2 round shields - 2 diffe.. This pack contains: - 4 raiders - 3 round shields - 3 kite shields - 4 la.. This pack contains: - 4 figures in resin armed with mixed weapons - 3 round .. This pack contains: - 4 different raiders - 3 round shields - 3 kite shield.. This pack contains: - 4 figures in resin armed with mixed weapons - 3 round.. This pack contains: - 6 archers figures in resin - 6 different heads - 6x 2.. This pack contains: - 6 City Militia figures in resin - 6 different heads -.. This pack contains: - 1 Officer - 1 Horn Blower - 1 Standard Bearer - 3 di.. This pack contains: - 3 figures in resin armed with bows - 3 different hors.. This pack contains: - 3 figures in resin armed with Lances - 3 different hor..